Some people like having artificial plants around for various reasons. Maybe they don’t want to worry about watering and constantly caring for living plants. Perhaps they have allergies and don’t want to aggravate them. Or maybe they’re worried about their pets accidentally eating them and getting sick. Foliage Design Systems of Birmingham, Alabama, can supply you with beautiful artificial plants to decorate your home or business. 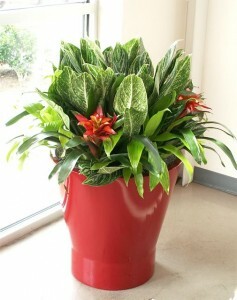 When choosing artificial plants to use, Foliage Design Systems looks for ones of high quality. Artificial plants can be made of different materials– plastic, polyester and silk are common materials used to make them. If you’re trying to judge the quality of artificial plants, do some things that the folks at Foliage Design Systems do. First, pull on the leaves and see if they stay attached (good) or come off easily (bad). Next, notice how natural the coloring is– do the leaves look true to nature’s colors (good) or are they oddly bright or overwhelmingly strong, looking fake (bad)? Cheap plants may look good from one angle, but appear thin and limp from another, so turn the plant around to see if it looks full (good) or too thin (bad). Ask yourself this: does the pot fit the plant? Are they in good proportion to one another? You don’t want a huge pot for a tiny plant. You also don’t want a tiny pot for a tall and wide plant. Artificial plants don’t require the kind of care living plants need. They can handle all sorts of weather and still look great. Foliage Design Systems of Alabama can supply you with decorative artificial plants– or live ones– depending on what you’d like. Call 205-229-3043 to ask about the various plant options available in Birmingham and surrounding communities.